Fluffy Audio presents Stefania Maratti - Solo Flute, the first Kontakt instrument in their new Solo Woodwinds series. BigSwingFace introduces BSF Tenor Trombone, the first in a series of big-band horn sample libraries for Native Instruments Kontakt 5. Impact Soundworks has launched its one-week Black Friday sale, offering up to 50% off on some of their Kontakt orchestral libraries. Native Instruments has launched a crossgrade offer for Komplete users who want to acquire the Symphony orchestral libraries. Native Instruments collaborated with Soundiron to design un dual brass sample library that can be purchased separately or bundled. VSL announces the release of a new Standard Library dedicated to brass instruments, the Vienna Dimension Brass II. VSL has released the sequel to the Clarinet (Bb) instrument to complete the library included in the Woodwinds I collection. 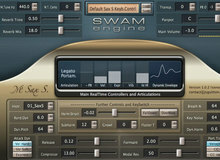 Spitfire launches a second library for Kontakt dedicated to Andy Findon and his exotic flutes. The second sample library that Embertone had teased at NAMM 2015 is now available, if you like crystalline clear sounds. Embertone quickly introduced it at NAMM, you can now discover the new Herring Clarinet and purchase it for a special price until February 25th.